Bands that choose to follow a democratic path to writing and performing music frequently take a little longer to develop than those that cater to the whims of a single front man. The wait for those who persevere, however, usually pays off in a big way. Take, for example, the case of Old Crow Medicine Show. Much was made of the outfit when it joined the Nettwerk family and issued its self-titled set four years ago. Although the group took a few leaps forward on its follow-up endeavor Big Iron World, there was still a nagging sense that the ensemble hadn’t yet found its groove. In short, Old Crow Medicine Show not only continued to rely on cover tunes to do its heavy lifting, but it also remained better on stage, where the forcefulness of its adrenaline-soaked attack was able to mask the deficiencies in its material. Tennessee Pusher is, then, the album that Old Crow Medicine Show’s devoted followers — of which there now are quite a few — consistently have professed that the band could make. Musically, the collection still zigs and zags its way from giddy bluegrass (Alabama High-Test) to easy-going, country-folk (Next Go ’Round). Yet, by changing producers from David Rawlings to Don Was, the collective found the right balance between its interest in rustic, old-time fare and its aggressive, contemporary spirit. Nothing feels as if it has been forced into place, and the results are splendid. In essence, Was tweaked Old Crow Medicine Show’s approach ever so slightly by bending it toward the flood of revivalist fare that dominated the latter half of the 1960s. Bob Dylan’s John Wesley Harding and The Band’s Music from Big Pink always have loomed large on the landscape of popular culture, and with each passing year, the artistic relevance of The Byrds’ Sweetheart of the Rodeo has seemed to grow stronger. While Old Crow Medicine Show’s Tennessee Pusher might not achieve the same level of perfection, it nevertheless is the modern-day equivalent of these classic albums. With the help of veteran drummer Jim Keltner and keyboard player Benmont Tench, the ensemble is corralled just enough to keep it from veering off the tracks. 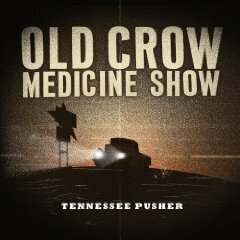 Although it largely follows a familiar template, Tennessee Pusher differs from Old Crow Medicine Show’s previous endeavors in one very big way. Emphasizing original material rather than cover tunes, it highlights the ensemble’s growth and maturity as songwriters and performers. Within its lyrics, Old Crow Medicine Show conjures visions of Hell on Earth by vividly capturing the detailed stories of coal miners and mothers who not only are struggling to survive but also are desperate to escape the trappings of their fates. Love is lost rather than found, and those who try to help the masses are gunned down in the street. Nickel Creek - Why Should the Fire Die?